AleReportage. "Sanchi_16." Digital image. AleReportage's Flickr Photostream. Accessed August 20, 2010. http://www.flickr.com/photos/alereportage/2554581752/. AleReportage. "Sanchi_2." Digital image. AleReportage's Flickr Photostream. Accessed August 20, 2010. http://www.flickr.com/photos/alereportage/2554584758/in/set-72157605456146615/. AleReportage. "Sanchi_30." Digital image. AleReportage's Flickr Photostream. Accessed August 20, 2010. http://www.flickr.com/photos/alereportage/2554601936/in/set-72157605456146615/. Asoka Kandahar." Digital image. Wikipedia Commons. Accessed August 20, 2010. http://commons.wikimedia.org/wiki/File:AsokaKandahar.jpg. Cunningham, Alexander. "Inscriptions of Ashoka, Corpus Inscriptionum Indicarum Vol. 1." Digital image. Accessed August 20, 2010. http://www.archive.org/stream/inscriptionsaso00hultgoog#page/n8/mode/1up. Gandhara Buddha. Tokyo National Museum, Tokyo, Japan. Geiger, Johann Nepomuk. Die Hunnen Im Kampf Mit Den Alanen. 1873. Mahwash. "Gar Konad Saheb-E-Man (If My Eyes Meet The Ones Of The Lord)." By Saheb & Ustad M Sarahang. In Radio Kaboul. Accords Croisés, 2003, CD. "Mōko Shūrai Ekotoba 2." Digital image. Wikipedia Commons. Accessed August 20, 2010. http://commons.wikimedia.org/wiki/File:M%C5%8Dko_Sh%C5%ABrai_Ekotoba_2.jpg. Repin, Ilja Jefimowitsch. Ivan the Terrible and His Son Ivan on November 16th, 1581. 1885. State Tretyakov Gallery, Moscow. Royer, Lionel-Noël. Vercingetorix Throws Down His Arms at the Feet of Julius Caesar. 1899. Crozatier Museum, Puy-en-Velay. Unknown. The Battle of Panipat and the Death of Sultan Ibrāhīm, the Last of the Lōdī Sultans of Delhi, from Illuminated Manuscript Baburnama (Memoirs of Babur). Walters Art Museum, Baltimore, MD. Make no mistake. Imperial history was bloody. Brutal assassinations, unthinkable acts of torture, and brash displays of treachery were commonplace. But ironically, it was bloodshed that, for a time, put an end to bloodshed. When 100,000 people were killed by King Ashoka’s Mauryan army, something changed. Ashoka was so devastated by the carnage that he had caused that he surrendered himself to a Buddhist life of nonviolence and righteous duty. Ashoka was the ruler of the Mauryan Empire that was based in northern India and in Afghanistan as well. He was the kind of great ruler that the Buddhists idolized. A shakravartan, a great leader who exemplified the Buddhist values and supported and patronized Buddhism. In terms of political support and patronage, he was probably the most important figure in the development of early Buddhism both in India and in Afghanistan. 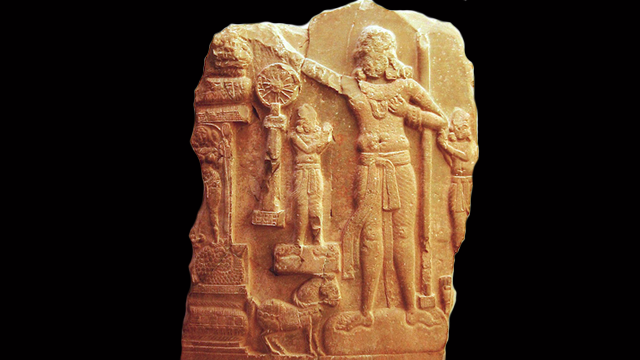 Ashoka traveled throughout his Empire, spreading Buddhist ideals. He left 33 edicts carved in stone. The edicts told the story of a benevolent King who spread ideas of piety, respect, and nonviolence. Ashoka’s reign helped strengthen Buddhism in Afghanistan. It provided a foundation for the religion to flourish for hundreds of years. Ashokha's stone edict in Kandahar was ironically lost to war in the 20th century. Here is the story of a benevolent king who spread ideas of piety, respect, and nonviolence. Read his message to the citizens of Kandahar.